Please contact owner Troy at 706-491-three eight two two. Boat is located in Eastanollee, Georgia. 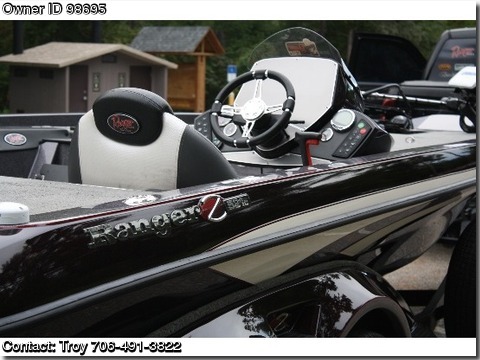 2014 Ranger Z521c, MERCURY 250 pro XS, Fury prop, 109 Motorguide tm/RMC lock, 4 bank Minnkota PC charger, Atlas 10" hyd jackplate, tour package( includes cover, park brake on trailer, upgraded wheels, oxygenator), 2 eight foot Power Pole Blades, Hot Foot, Hydro Wave, 2 Lowrance HDS nines (Ram mount on bow, down scan on tm, structure scan, temp sensor in live well), keel guard,boat was used one season and was wrapped entire time. Minutes from lake for test drive. $59000 . Option for complete set of Litium Pro batteries.